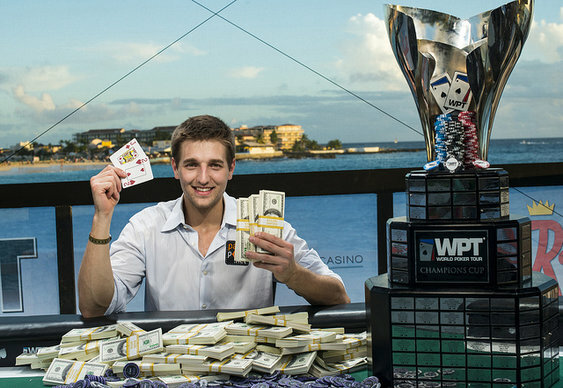 WPT analyst and presenter, Tony 'Bond18' Dunst, swapped commentary for chip collecting this weekend after making the final of this year's WPT Caribbean Main Event. Having made his way past more than 185 players, Dunst was able to keep his calm during yesterday's final table as the likes of Giacomo Fundaro and Marvin Rettenmaier fell just short of the title. Starting out the session at the top of the chip chart, Dunst was able to weather an early storm and eliminate Robert Bakker (holding pocket aces) after his Jc Tc made a flush on a Ac Th 5c 2d Qc board. Dunst was soon playing the role of executioner again when his Ac Qc caught a pair on the river to oust Fundaro and his pocket eights in fifth place. Now down to four players it was time for Dunst to take a step back as Severin Schleser eliminated pre-final favourite, Marvin Rettenmaier. With the title now looming large on the horizon, Dunst resumed his dominance by eliminating Schleser in third and bagging enough chips to take a commanding lead into a heads-up clash with Giacomo Fundaro. Indeed, that lead would prove too much for Fundaro to handle and after just five hands he eventually handed over the last of his chips to Dunst. With nothing left to do but bask in the glory of his first WPT title, Dunst threw his arms aloft as his friends and colleagues rushed in to congratulate him.